The SOQI Far Infrared Sauna for portable home health. Natural healing technology known as Thermal Therapy. FREE E.Books, Video, x2 Risers, x2 Armrests. Everyone benefits from Far Infrared Ray (FIR) in sunlight. ALL life forms - humans, animals and plants - need Far Infrared. If you are looking for serious natural healing and wellness in the comfort of your home, the SOQI Dome's advanced Japanese health technology remains unsurpassed. 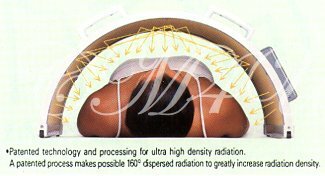 The Far Infrared heat radiating from the Dome's inner surface does more than warm and relax the body. Unlike regular heat, Far Infrared heat promotes healing and detoxification of the body from the inside out. Simply place the dome over the area you need to receive therapy. Benefits include increased circulation, rapid pain relief with reduction in swelling and inflammation, serious toxin elimination (heavy metals included), accelerated healing, tissue regeneration, healthy breathing, relaxation and much more. large sizes, with risers and armrests included. There is minimal to zero sweating so you can leave your clothes on, or wear loose clothing, or just your underwear. Traditional saunas heat up the air around you to a very high temperature creating 'wet' heat thereby causing the body to sweat profusely, whereas the Far Infrared sauna dome heat emits a gentle controlled far infrared 'dry' heat. Toxins are released into the blood stream and eliminated via urine and feces. The effects of far infrared ray, which travel in a straight line, weaken with distance, so the closer to the source of the far infrared rays your body is, the more impact they will have. 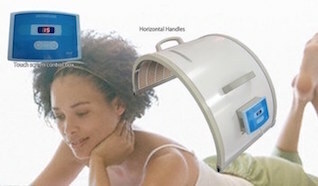 The Far Infrared Dome was designed to be very close to the body for optimal health benefits. Falling asleep is optional and often happens. The FIR Dome may be used with the original Chi Machine. This unique ceramic heater for the body has a specially arched design and multifaceted acute-angled silicon crystal chip inner surface that maximizes the penetrating radiant heat energy absorbed by the body, thereby enhancing the thermal energy effect. It's easy to use, portable and 100% safe for people of all ages, including family pets. 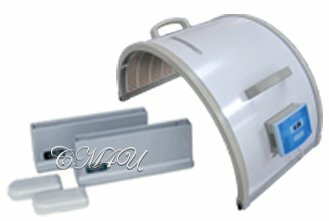 The SOQI Far Infrared (FIR - far infrared ray) dome sauna is part of the family of SOQI machines manufactured by HTE with technical cooperation from Japanese Skylite Corporation (Sukairaito). Approval was obtained for the manufacture of this machine as a "Remedial Device", from the Japanese Ministry of Health and Welfare - Health Maintenance Device, Approval Certification No. 63B 1049 -17th June 1988. Read, chat on the phone, watch TV, relax, enjoy. The Far Infrared Dome Sauna has earned popular and professional acclaim in Japan, Asia, Australia, the USA, Canada and Mexico during over two decades of successful results. It is classified and regulated as a Medical Device in Japan, China, Australia, Canada and USA. Far Infrared ray are measured in microns. The Far Infrared Hothouse sauna dome generates FIR heat energy at 8-10 microns (7-14 is acceptable), the most beneficial wavelength to the human body. Normal human body temperature is 98.6 degrees Fahrenheit. The dome directed over your body, matches the FIR energy leaving your body and is perceived as a gentle, subtle warmth. The absorption of FIR energy from the dome stimulates circulation to peripheral areas, thus allowing your body to regenerate and maintain health as you relax and enjoy the warmth and comfort around you. FYI: A room full of people can become very warm due to all the far infrared ray being radiated back and forth. The SOQI Far Infrared Sauna Dome's upper radiant heating surface is covered with a very fine multi-faceted acute-angle silicon surface manufactured in New Mexico. When heat rays are scattered in all directions by the countless surfaces created by the silicon crystal chips, the effectiveness of the 160-degree dome span is amplified. The radiant transmission area is increased some tenfold. It simply wouldn't be possible to produce the effective warmth the FIR dome achieves without the combination of these two design concepts: proper wavelength and a special reflective silicon crystal surface. 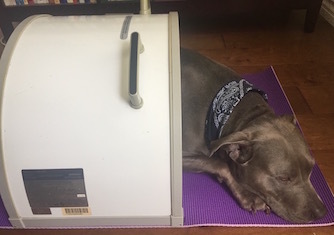 NOTE: This unique and advanced technology has not been duplicated or copied by any other far infrared sauna unit in the world. to gently warm and soothe away back challenges. remain sitting with the dome curved around your back. 9) EMF measures low at just over 2.0 milligauss on a Tri Field Meter, making it safer than daily use of a cell phone or computer. are beneficial to the skin, the body and the mind. No sweating involved, clothing is optional. Drink one glass of water for every 30 to 60 minutes of therapy, to flush out released toxins, and for hydration. Head and Face: Users that chose to do so opt for short periods of time, 5 to 15 mins. Keep eyes closed - a washcloth may be placed over your eyes to enable relaxation, or two moistened cotton balls, or a sleep mask. Natural, Safe Healing: Far Infrared heat maintains, supports and promotes natural healing as nature intended. There are no side effects, no risk of injury. Completely non-toxic. May be addictive! as well as family members. Far Infrared unit to be introduced to N. America. Are you comparison shopping for a Far Infrared sauna? 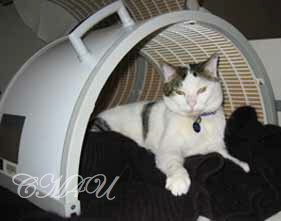 The SOQI Far Infrared Dome Sauna is often combined with the Original Sun Ancon Chi Machine. 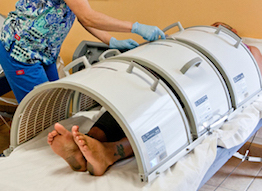 Some people, such as those with ongoing health challenges, as well as spas, health institutes and alternative health practitioners, prefer to purchase more than one far infrared dome for whole body hyperthermia. of the natural healing far infrared ray. 100% pure Far Infrared heat. Close to the body for maximum benefit. x2 Armrests, FREE E.Books and Video. 15.8" / 401 mm - floor to top. 31.7" / 805 mm - side to side. Unit weighs 16.5 lb / 7.5 kg. For all shapes and sizes - measurements. FAST DELIVERY - 1-5 business days USA. Shipped from head office, Los Angeles, CA. Massage table, one remote control unit, built in MP3 player, x3 Far Infrared Domes and x1 Original Chi Machine. Luxury set up for spas, health clubs, beauty salons, yoga centers and healing professionals, as well as within the comfort of your home. Eye-opening health & beauty articles. This website is for informational and educational purposes and is not intended to provide individual medical advice which may be obtained from your chosen healthcare practitioner. Chi Machine International does not claim that any HTE product presented herein will diagnose, treat, cure, mitigate or prevent any disease. Always ask questions, research everything. 2002-2019 Chi Machine International, Independent HTE Distributor.